How are you on this delightful Monday? Today I have a sweet scrappy wreath to show you. while sitting in front of the fire. and today we are supposed to get some more. Ah, how I love the snow! 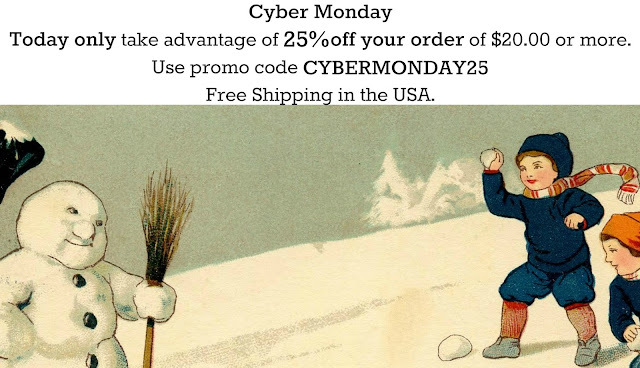 has a Cyber Monday deal. Plus, free shipping in the USA. Now onto the scrappy wreaths. . . Here is the wreath before. . .
it's about 14-inches in size. and wrap them around the wreath. Secure the ends with hot glue. so that every strip matches. Tie the strip of fabric in a knot. Do this with the tulle as well. then a strip of white and cream tulle. you get to decorate it to your liking. with a ribbon rosette in the center. Then I added tulle pom poms. I simply used tulle trim and rolled it up to create a pom pom. In the center of my pom poms I added pretty gems. to give it the perfect shabby look. is that you can hang it anyway you like. You can have the embellishments on the left. . .
On the bottom. . .
On the right. . . I made another one with silver and white tones. . .
perfect to hang in your home during the winter season. I used a stunning 3D glitter snowflake. and you can even make one for every season. or hanging around the home as charming Christmas decor. and I appreciate your sweet comments! . . .Love and Hugs. . .
Because I know He's mine. but may our gratitude live on each and every day. Thanksgiving is not merely a day to be observed once a year. . .
for the Christian is must be a way of daily living. shew forth from day to day his salvation. his marvellous works among all nations. for he is good; for his mercy endureth for ever. This lovely little lady is Miss Evangeline. I thought it was the perfect time to share how I received her. celebrated her 60th birthday back in March. she decided to send out 60 random acts of kindness during this year. well, I was honored and amazed. and yes, that's a tiny teddy bear that she's holding. You can view the page by clicking here. but because I found a sweet Sister in the Lord. and it's a privilege to say that I have been blessed by her. blogging friends are very special and truly amazing. Please know that I am incredibly thankful for all of you. Have a blessed Lord's Day, sweet friends. I hope my American blogging friends had a beautiful Thanksgiving. and oh, what a delight it was! We enjoyed good food, fellowship, and sweet laughter. that I am offering 15% off your order at Rose Petal Blessings. Simply enter TISTHESEASON15 when you checkout. I have all kinds of goodies up my sleeve. Listed below are treasures you could receive for FREE with your purchase. If you spend $30.00 you will receive two tea cup coasters. If you spend $40.00 you will receive a fabric storage basket. If you spend $50.00 you will receive a mug rug with a linen napkin. must be $30.00 or greater after using the discount. There are lots of new handmade goodies in the shop, dear friends. Here is a little peek. . .
Christmas ornaments to adorn your tree. . .or packages. Hair clips or brooches. . .however you want to wear them. Little pocket coasters filled to the brim with goodies. Stop by Rose Petal Blessings and take a look around. And don't forget 15% off your entire purchase - no minimum required. Enter TISTHESEASON15 when you checkout. Thanks for visiting, lovely friends! I hope your weekend is extra wonderful! and talk of thy power. reveal the majesty of God and glorify Him. expressions of praise and alleluia. There there is discord, unity. For it is in giving, that we receive. and in Israel, and among other men; and hast made thee a name, as at this day. are all things: to whom be glory for ever. and the sea, and the fountains of waters. the seas, and every thing that moveth therein. original poetry, music, painting. . . ? let us not forget to look around and see all that the Lord has blessed us with. Let us join all of creation in worship and praise of the great Creator. and for His wonders of creation. May you have a most blessed and beautiful Thanksgiving, dear friends. A Heart Filled With Gratitude. . . Tea Cups and Mugs and Sweets, Oh My!